Remember when the Transparency of Lobbying, Third-Party Campaigning and Trade Union Administration Act (otherwise known as the Gagging Act) was passed, in January this year? Vox Political warned that it marked the end of free speech and free protest in the UK. The article showed that the new law means you may no longer link up with others to protest government actions in any meaningful way – as such action may breach Liberal Democrat and Tory government-imposed spending limits. Your personal complaints will be deemed unrepresentative of the people. In that article, this blog asked why the government has launched its attack on free speech and free protest, and suggested the following: Perhaps it wants to control the information you receive, on which you base your voting intentions? This week we received confirmation of that theory – or at least, some of us did. The ‘tax statements’ being sent out to Income Taxpayers by the Treasury – on the orders of George Osborne – are nothing less than party political electioneering, being carried out using those taxpayers’ own money rather than the Tory Party’s funds. The leaflet is worded in a very carefully-chosen way that betrays a clear intention to mislead readers – most particularly about the amount of our Income Tax that is spent on ‘welfare’. To illustrate the extent of the problem: We cannot say this is the same as social security, as – according to the terms of the leaflet – it isn’t. Apparently a quarter of our money is spent on ‘welfare’, which is then broken down into bizarre categories like ‘social protection’ – including, alongside social security, personal care services which nobody has defined as ‘welfare’ until know, and the pensions of retired mandarins, colonels and lowlier public servants who will be appalled to hear their hard-earned retirement provision re-labelled as ‘welfare’, according to The Guardian‘s editorial on the subject. 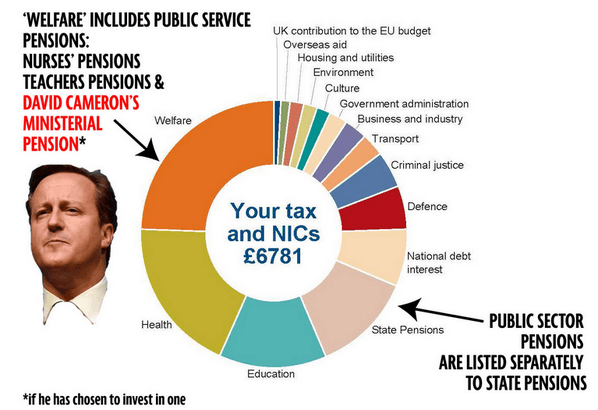 David Cameron’s pension would be defined as ‘welfare’, according to this categorisation. Meanwhile, state pensions have been defined as being paid from an entirely different source (they aren’t), in order to safeguard the Grey vote from the indignation that – clearly – this piece of politically-prompted propaganda is intended to stoke. The fact is that – as the Mirror points out – Income Taxpayers put a lot more than 12p in every pound towards pensions, and a lot less than 24p in every pound towards working-age benefits. Here are another couple of tricks – possibly the nastiest of the lot: Firstly, the leaflet does not make it clear that ‘welfare’ payments are made to people who have a right to them “because of family or medical circumstance, or indeed a record of national insurance contributions”. The impression foisted on the reader is of “unearned handouts to the poor”, according to the Guardian editorial. Secondly, the leaflet as a whole does not mention the contribution of VAT payments to the national purse. This is because the government has cut Income Tax (irrationally – it has a huge deficit and debt to pay off but has reduced its own income). The thinking behind this is that people will think they have been allowed to keep more of the money they have earned. But the same government has increased VAT, meaning that – in fact – people are being taxed more heavily! “You would be led to believe that the governments policies are working, exactly the way the government says they are working. “You would not have any reason to believe that the government is lying to you on a daily basis. What a relief that nobody believes that filthy liar Osborne – even his own backbenchers! This is how they see him – offering empty promises as a ‘carrot’ to encourage voters to support the Tories. Osborne’s behaviour is so appalling that this blog has started a petition, calling on the government to withdraw these propaganda sheets that pretend to be official government information – and apologise for ever releasing them in the first place. It is on the Change.org website, please sign it by clicking here. Other blogs on the ‘tax summaries’ are available from Virtual Gherkin and Same Difference. We must not allow this abuse of public authority – and public funds – to take place. exposing the Tories’ crass political stunts! Well done!! Am forwarding the blog and petition to everyone I know. And using public funds just takes the biscuit! There is also a fair sized chunk of that “welfare” bit that goes to pensioners in the form of means tested benefits: pension credit, housing benefit, council tax benefit, cold weather payments etc. Plus a lot of pensioners claim DLA, attendance allowance and what about winter fuel allowance, is that clumped in with “welfare”? I do not begrudge pensioners 1p, but I read once, on the DWP statistics page, that pensioners received approx 70% of the total benefits spend, if you added together all of the above, and the state pension which accounts for 46% alone. I read this several years ago, I imagine it will be more now as there are many more pensioners because we are living longer. This tax statement does not tell the truth at all, and is just being used to gain public support for yet more cuts for working age claimants. The benefit bill will increase year on year, as year on year pensioner numbers will increase, and fiddling around with working age benefits will achieve diddly- squat! Same here – sending to everyone I know and even those I don’t! It’s not welfare its social security. Somewhere in the article I make the point that we can’t apply the term ‘social security’ to what they’re calling ‘Welfare’ in this case, because they’ve bolted so many other items onto it. This is a government attempt to ramp up hatred of the disabled that this unlovely government is doing. Is the document either as a whole, or in part capable of being considered a ‘hate crime’?